The problem with most competitive puzzle games I’ve played is that they feel like they all boil down to who can make matches faster. And due to the random distribution of blocks, it makes competition a matter of luck rather than skill. Games like Tetris try to fix that by allowing you to hold blocks for later, but it doesn’t fix the core issue of it mostly being a game of chance. Puzzle Fighter and games of its ilk understood what makes for a good competition in puzzle games. Rather than race to merely match blocks together or make lines, you’re pairing gems of the same color together to then shatter using “exploding gems,” which would then send those gems into the opponent’s field. The catch being that they then carry a timer on them, rendering those gems useless until time expired. It took the emphasis off of merely matching together blocks quickly and on skillful play. 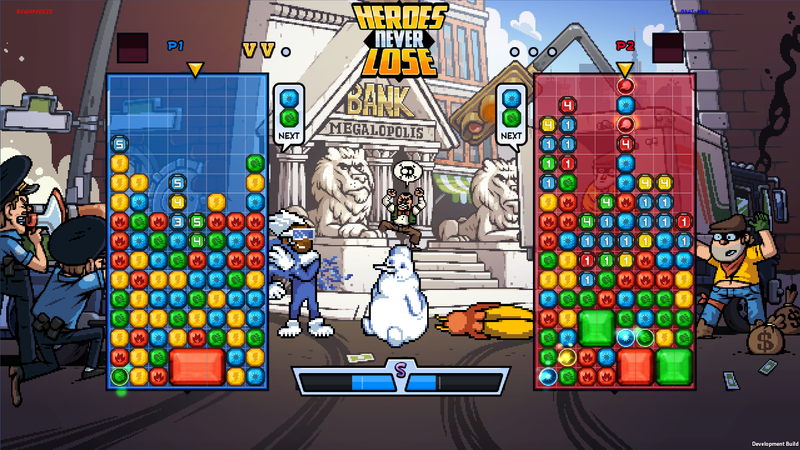 Heroes Never Lose: Professor Puzzler’s Perplexing Ploy, which just got funded on Kickstarter, is essentially a superhero-themed take on Puzzle Fighter. You square off against your opponent by matching blocks of the same color together and then destroying them using “breakers” of the same color, which then sends them to your opponent’s grid for them to deal with. Sounds familiar, right? All the while, however, you build energy that allows you to unleash your character’s super attack once filled, which can greatly change the tide of battle. The expressive pixel art lends a ton of personality to the proceedings. It’s hard not to look away from the board and watch the heroes battle instead, let alone what goes down in the background. As the characters are all superheroes, they’re specials play off their powers. For instance, Brainfreeze can make any new pairs of blocks frozen, meaning they’re locked in place instead of being at the whims of gravity, and Firestarter can set blocks on fire, which then spreads throughout the grid, turning any blocks it touches into ash. On their own, they’re but minor inconveniences, but delivered correctly, they can absolutely demolish your opponent. Though the build I played was still very early, the powers felt balanced. None of them felt like they could completely knock a player out of the running by default. Even in the most dire scenarios, I felt I could make a comeback. Because it’s not a simple game of matchmaking, the game becomes more tense and methodical. It’s less about speed and more about tactics. It’s a constant struggle to decide when to emphasize speed over quantity, when to save that energy for your super or unleash it early for your weaker special attack to buy yourself some more time. There was already a ton of strategy in how you arrange your blocks (whether to focus on one color or hope for one of those rare rainbow breakers and clear most of your grid in one go), but the addition of supers adds considerable depth. Heroes Never Lose shows a lot of promise already. With the Kickstarter goal reached, it’s only a matter of time before the full game is ready to go. I eagerly await to see how it shapes up.